Rent Scaffolding SurabayaAneka Jaya Scaffolding serves scaffolding or steger rentals for Surabaya and surrounding areas. Starting from small and large scale projects. We are here to help speed up and facilitate the building of various projects you are working on with different types of scaffolding. 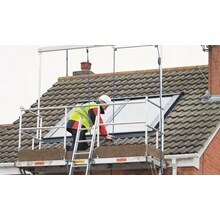 Working using Scaffolding is easier and safer than working with stairs. This is stable, forms a broad work platform and provides broad coverage. You will do a better job in half the time by not having to constantly move the ladder. The next time you have to work at altitude, consider hiring scaffolding instead of struggling with the stairs. Scaffolding provides a large and stable work platform where you can stack materials and organize your tools. With scaffolding, you can easily reach all areas of improvement to do a better job in half the time. And you will save a lot of time and energy by not going up and down constantly to change the position of your ladder.